Background: Identification of metabolites is of importance in the challenge of new psychoactive substances (NPS) as it could improve the detection window in biological matrices in clinical and forensic cases of intoxication. Considering the numerous and diverse NPS reported each year, producers increasingly appear today to be targeting non-controlled synthetic opioids, involving fentanyl derivatives such as furanyl fentanyl (Fu-F). Objective: This work aims to investigate and compare metabolites of Fu-F using two in vitro experimental approaches. Methods: CYP- and UGT-dependent metabolites of Fu-F were investigated by means of analyses of both human liver microsome (HLM) and hepatic (HepaRG) cell line incubates using liquid chromatography with high-resolution mass detection and, subsequently, compared and confronted to recently published data. Results: Seventeen Fu-F metabolites were produced and several metabolic pathways can be postulated. 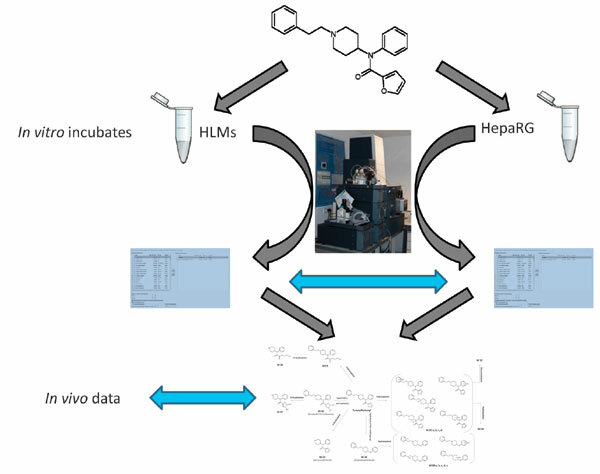 HLMs and HepaRG cultures appear to be complementary: HepaRG cells produced 9 additional metabolites, but which appear to be minor in vivo metabolites. Specific* and/or abundant Fu-F metabolites are dihydrodiol-Fu-F*, norFu-F* and despropionylfentanyl. However, norFu-F seems to be inconstantly observed in in vivo cases. Furthermore, a sulfate metabolite presents at significant rate in urine obtained from FU-F users was not identified here, as in another in vitro study. Conclusion: HLMs represent an acceptable first choice tool for a single NPS metabolism study in forensic laboratories. Dihydrodiol-Fu-F and despropionylfentanyl could be proposed as reliable metabolites to be recorded in HRMS libraries in order to improve detection of Fu-F users. Nevertheless, additional verifications of in vivo data remain necessary to confirm relevant blood and urinary metabolites of Fu-F.
Keywords: Furanyl-fentanyl, metabolites, HLM, HepaRG, LC-HRMS, NPS. Keywords:Furanyl-fentanyl, metabolites, HLM, HepaRG, LC-HRMS, NPS. Abstract:Background: Identification of metabolites is of importance in the challenge of new psychoactive substances (NPS) as it could improve the detection window in biological matrices in clinical and forensic cases of intoxication. Considering the numerous and diverse NPS reported each year, producers increasingly appear today to be targeting non-controlled synthetic opioids, involving fentanyl derivatives such as furanyl fentanyl (Fu-F).